Massachusetts may have dodged a storm-blizzard bullet. Thanks to a light and fluffy snow that didn’t weigh down tree branches and pull down power lines, the worst-case scenario of possibly hundreds of thousands of customers losing electricity was averted Tuesday, as the brutal storm that swept into the region finally appeared to be ebbing late Tuesday afternoon. Though 30,000 electric customers, mostly on the Cape and Nantucket, were still without power late Tuesday afternoon, utility officials were breathing a cautious sigh of relief that it could have been much worse for the state. They stress they’re not letting their guard down and are still treating conditions seriously. They haven’t ruled out nasty surprises and possible more outages, as strong winds stick around and snow continues to fall, though not as fast as it was falling Tuesday morning. 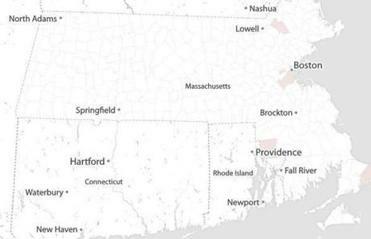 Power outage totals in Mass. A look at the number of homes without power in the state. “We are still facing significant travel constraints on the South Shore and the Cape,” said Michael Durand, spokesman for NStar, the state’s second largest utility with 1.1 million electric customers. Hundreds of repair crews remain out in often treacherous conditions trying to fix downed lines and damaged equipment, utility officials said. Still, the peak number of outages at one time today, or about 34,000 customers in Massachusetts, was far lower than originally feared when the storm first hit the region on Monday evening. National Grid had prepared for a “Type 2 event,” or the second worst possible type of storm, in which potentially one-third of its customers could have lost power. The utility even called in repair crews from Canada and from as far away as the state of Georgia. But it appears that the snow was fortunately “dry and light, like a powder,” said Navarro, who compared it to “great snow for skiing” and not nearly as damaging as heavy and wet snow often associated with nasty New England storms. “It’s really fortunate,” he said of the snow type that came down on Monday evening and through most of Tuesday. But he also noted that National Grid has invested millions of dollars in recent years on tree trimming and extra equipment that helped prevent some outages and helped restore power faster once outages occurred. “Some of the investments we’ve made in our infrastructure have paid off,” he said. NStar’s Durand said new remote switching devices allowed the utility to reroute power around damaged areas and restore power faster to many customers. Left unsaid is that utilities were pressured to take action by public officials. In 2012, the Department of Public Utilities slapped National Grid, NStar and Western Massachusetts Electric Co. with $24 million in fines -- most of them aimed at National Grid -- for their poor response to Tropical Storm Irene in 2011 and an early-season snowstorm in October 2011. Utilities have since addressed some of the criticisms raised by public officials in 2012, including improving communications with customers and towns during storms. For now, utilities are currently focusing on lingering major outage problems, mostly on the South Shore, Cape Cod, and Nantucket. On Nantucket, virtually all of its 12,800 customers lost power Tuesday morning when ocean salt water sprayed over a substation near the island’s harbor, covering and damaging equipment with ice. National Grid had restored power to more than 1,000 Nantucket customers as of late Tuesday afternoon. But the utility is warning that it may take days before all Nantucket customers see their electricity restored. In Provincetown, on the Cape’s outer tip, virtually all of its 5,600 customers lost power by early Tuesday afternoon. More than 1,000 Provincetown customers have since seen power restored by late afternoon, but thousands more were still awaiting service. “The difficulty is the high winds there,” said NStar’s Durand, noting that crews can’t use hydraulic repair buckets if winds are exceeding 40 miles per hour. The same problem is hampering restoration efforts in Plymouth and other South Shore and Cape communities, though some customers are slowly seeing power returned in some areas, he said. Durand said NStar still assumes it will be a “multi-day restoration” effort in some communities.